Visitors to the archaeological site of Karnak may see little more than a jumble of ruinous sandstone blocks and statues. But beneath this apparent chaos is an elaborate religious complex of massive pylons and pillars, decorated columns and courts, shrines and sacred lakes with enchanting processional avenues lined with sphinxes. For ruler after ruler over a period of some 2,000 years of Egypt’s past, this was the ancient Egyptian god Amun-Ra’s house on earth. Today, Karnak is the second largest religious site in the World, second to Angkor Wat in Cambodia. And the scaffolding and cranes are a testament to the continuing work of international teams of archaeologists working with Egyptian Egyptologists. Programmes of excavation and restoration come together here to make the site more accessible and comprehensible for the many tourists who come to the site each year. 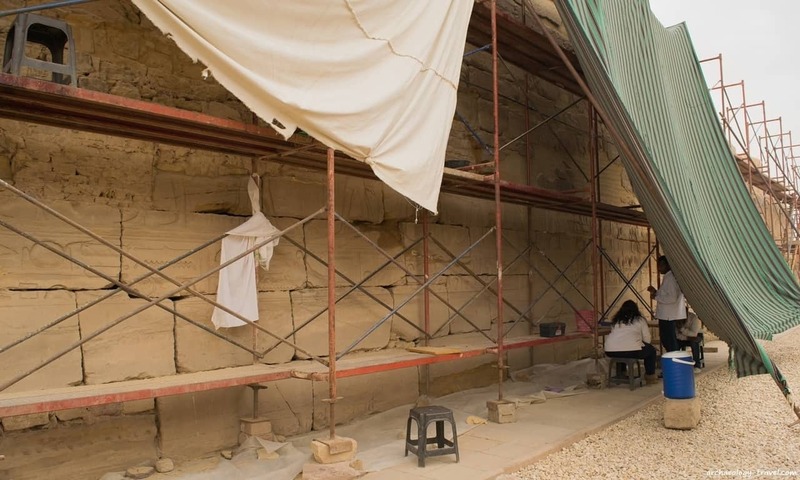 One of the conversation projects currently underway at the Karnak complex is the restoration of the carving and inscriptions of the Temple of Khonsu. On my recent trip to Egypt, sponsored by Cyplon Holidays UK and EgyptAir, Karnak was our first stop. Besides an engaging tour of the highlights of the site lead by our guide Tarek Elshimy, our group was shown recent archaeological work at Karnak by members of the Supreme Council of Antiquities in Luxor. We were given a tour by Salah Ahmed, a leading archaeologist in the council, of the recent excavations in front of the first Pylon. 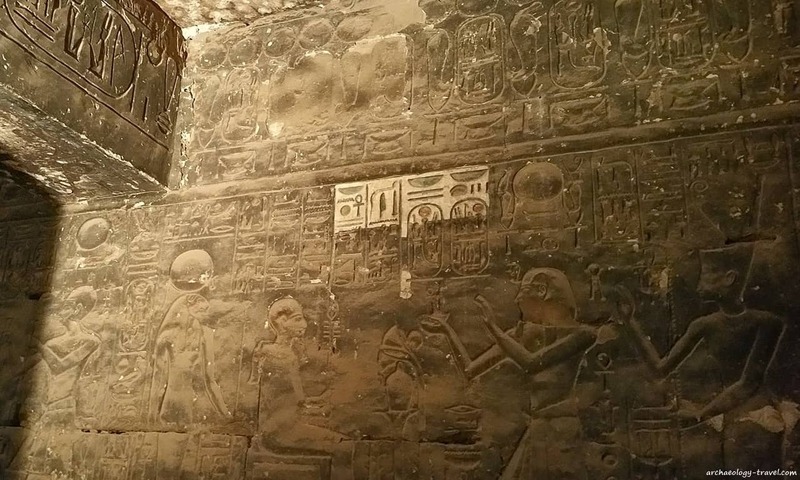 And the General Director of Antiquities of Luxor, Dr Mostafa Waziry, gave us a preview of the progress being made on cleaning the painted carvings and inscriptions in small rooms that surround the sanctuary in the Temple of Khonsu. The Temple of Khonsu is one of the best preserved and almost complete of the New Kingdom temples, with exquisite decoration. And therefore well worth visiting. Unfortunately, as it is set away from the main temple in the Precinct of Amun-Ra it is often overlooked, particularly by tour groups that have limited time at Karnak. 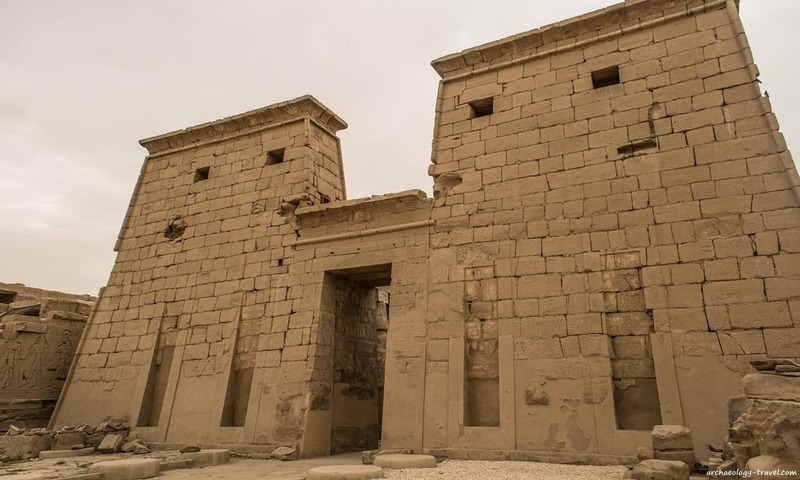 For several years now the American Research Center in Egypt in collaboration with Centre Franco-Égyptien d’Étude des Temples de Karnak (the Franco-Egyptian Centre for the study of the Karnak Temples) have been preparing the temple for visitors. 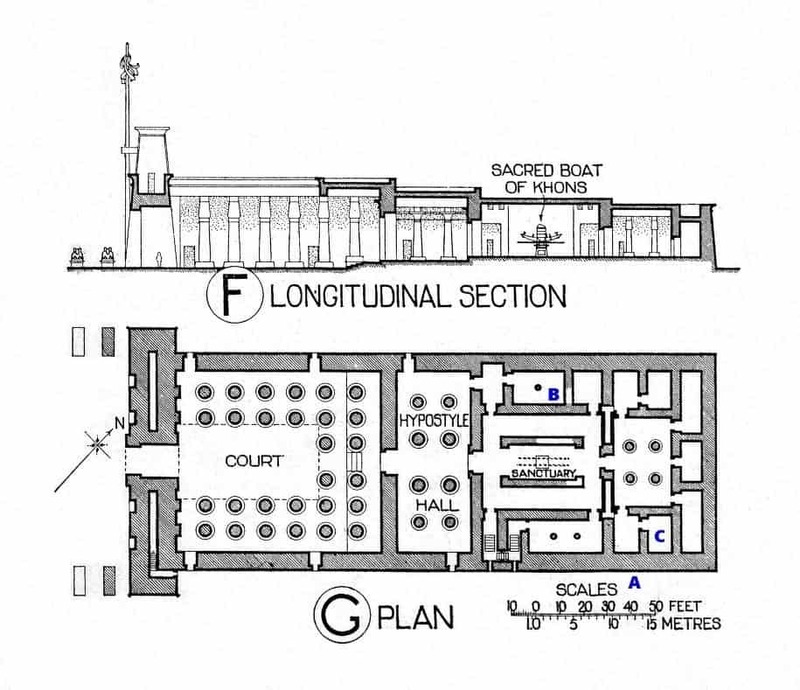 Conservators working on the south-eastern external wall of the temple in March 2016, at point A on the plans below. For now, visitors to Karnak are only able to enter the Peristyle Court and the Hypostyle Court of the Temple of Khonsu. The sanctuary with its surrounding rooms, sometimes called chapels, are currently closed while conservators painstakingly clean the painted bas relief carvings and hieroglyphs. Dr Waziry estimates that there is about ten months restoration work before these parts of the temple will be accessible for all visitors to Karnak, at no extra charge. A few of the walls in the temple are black with age and covered with years of dust, clearly seen in the ‘before’ photograph below (click on the image to enlarge it). In that photograph you can see a small test patch, where conservators have tested their cleaning techniques. For a more dramatic comparison have a look at the photograph to the right (and the photograph at the top of this page). This is what the walls look like ‘after’ the cleaning process, the difference really is astounding. It is easy to forget, and often difficult to imagine, that less than two hundred years ago these large structures were partially covered by the shifting sands of the desert. 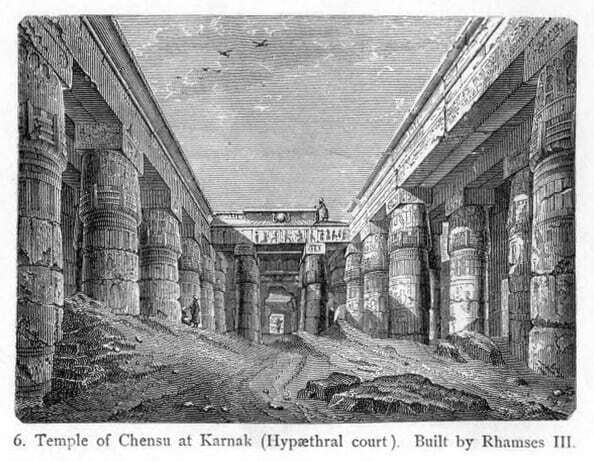 As can be seen in this late 19th century engraving of the Peristyle Court in the Temple of Khonsu. This engraving was published in Architecture, Sculpture, and the Industrial Arts Among the Nations of Antiquity / a series of illustrations arranged chronologically, and forming an atlas, to be used in connection with any work on the history of art. The authorized American edition was published in 1879 under the supervision of S. R. Koehler. Boston: L. Prang and Company, Series I. Copyright: University of Michigan Library Digital Collections: Historic Illustrations of Art and Architecture. These photographs show the carved and painted images and texts on the walls of the small rooms that surround the temple’s sanctuary. The specific function of these rooms is not fully understood, but they were used by the High Priests to store the god’s belongings, his jewellery and insignia, as well as other ritual objects. 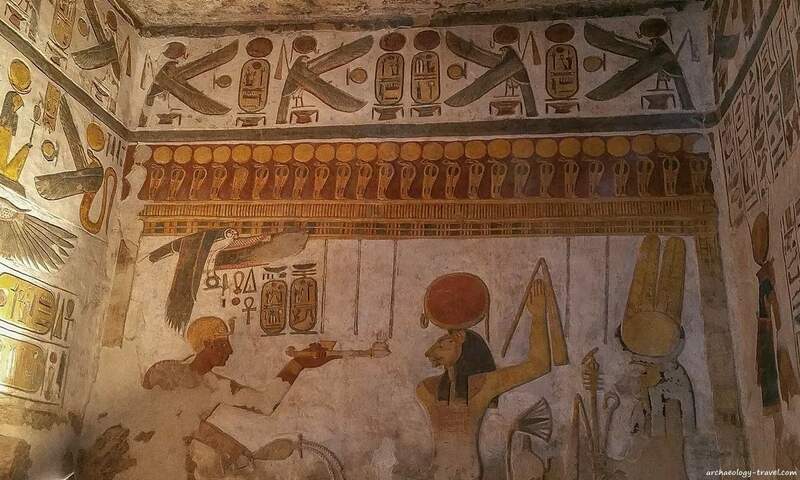 Besides restoring these images for their former glory for us all to see, cleaning them allows Egyptologists a better idea of what they looked like, to learn more about the colour symbolism of the carved images and texts, and hopefully to learn more about what these rooms were used for. If you are going to Karnak, I strongly recommend spending a bit more time exploring beyond the main temple complex to visit this beautiful, well preserved temple. I am sure you will be glad you did! Khonsu was the son of the chief deity Amun-Ra and his wife the goddess Mut. Together these three formed what is known as the Theban Triad of the ancient Egyptian pantheon. And so it was that Ramses III thought it appropriate perhaps even necessary to construct a temple dedicated to Khonsu within the Precinct of Amun-Ra. From the inscriptions of the temple, archaeologists are quite certain that it was Ramses III who initiated construction of the temple. Besides the images and names for Ramses III, the names of Ramesses IV, Ramesses XI, Ramesses XII, Herihor and Pinedjem have also been found on the temple and pylon. Here Egyptologists are divided. 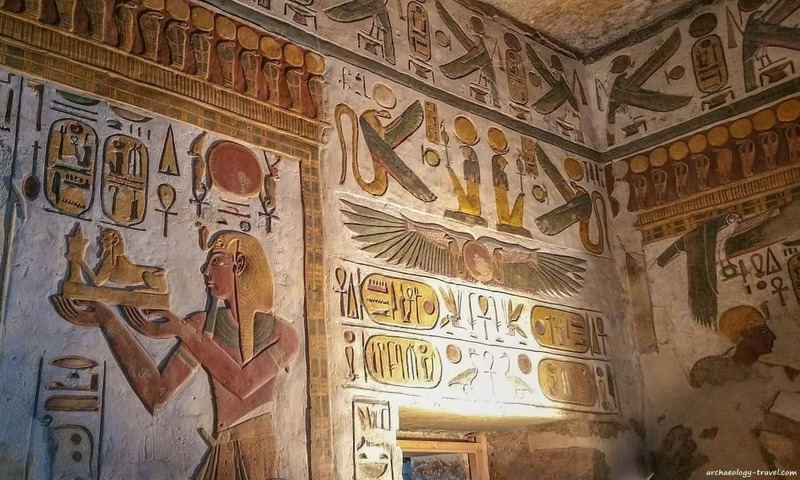 On the one hand some think it was Ramses III (perhaps even Ramses IV) who completed the temple, while the later kings and high priests took advantage of blank spaces to apply their names and images. to the temple of the god. Others suggest that each king inscribed that part of the temple that he built. Pylon at the entrance to the Temple of Khonsu, Karnak. These diagrams of the Temple of Khonsu were made by Banister Fletcher and published in his 1921 book A History of Architecture on the Comparative Method (Sixth edition, rewritten and enlarged, New York: Charles Scribner’s Sons). Copyright: University of Michigan Library Digital Collections: Historic Illustrations of Art and Architecture. Accessed 27 April 2016. 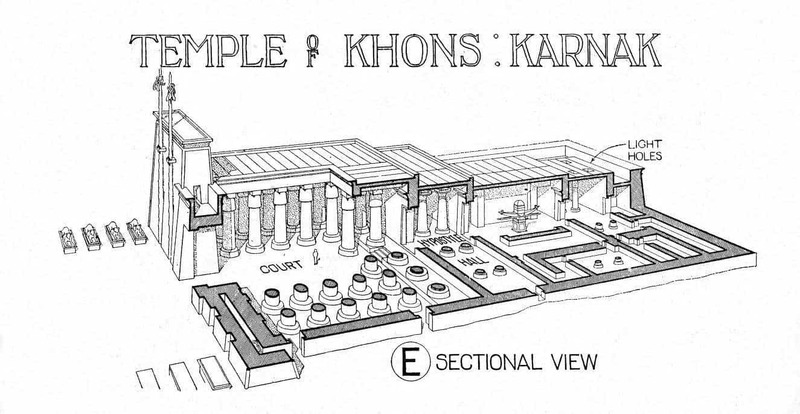 In the UCLA Digital Karnak project, see a full digital reconstruction of the Temple of Khonsu. Lotus flower columns in the Peristyle Hall, looking towards the Pylon. Looking through the Hypostyle Hall into the Sanctuary. The Temple of Khonsu is within the walls of the Precinct of Amun-Ra at Karnak. Situated in the western corner of the precinct, it is a smaller temple separate from the main temple complex. Entry to the temple is included in the cost of the Karnak site, which is 80 Egyptian Pounds. 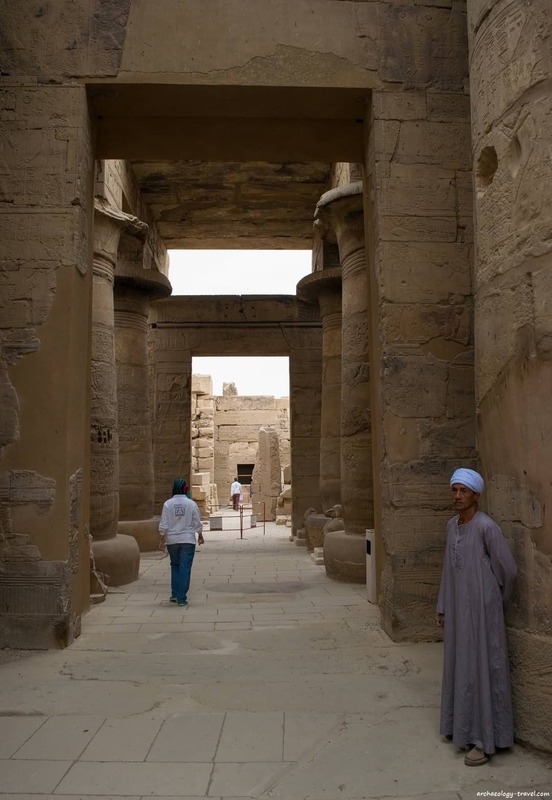 For those of you on tours from the cruise ships and the like, Karnak is included on most if not all itineraries. 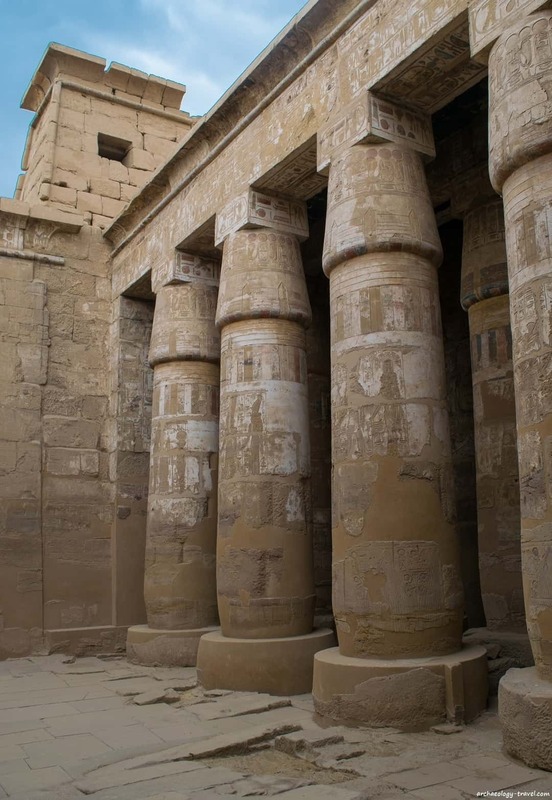 I visited Karnak while on a four-day cruise on the Oberoi Philae. Once your guide has finished pointing out the main features of the Karnak Temple Complex and if you get a bit of free time to wonder around yourself, ask your guide to point you in the direction of the temple – it is well worth a visit.